When Genndy Tartakovsky was at the helm of the Samurai Jack series over at Cartoon Network, one thing I distinctly remember was that often times the stories would be quite simple and straightforward, bu they would also have some deeper meanings. And often they could get very emotional too. 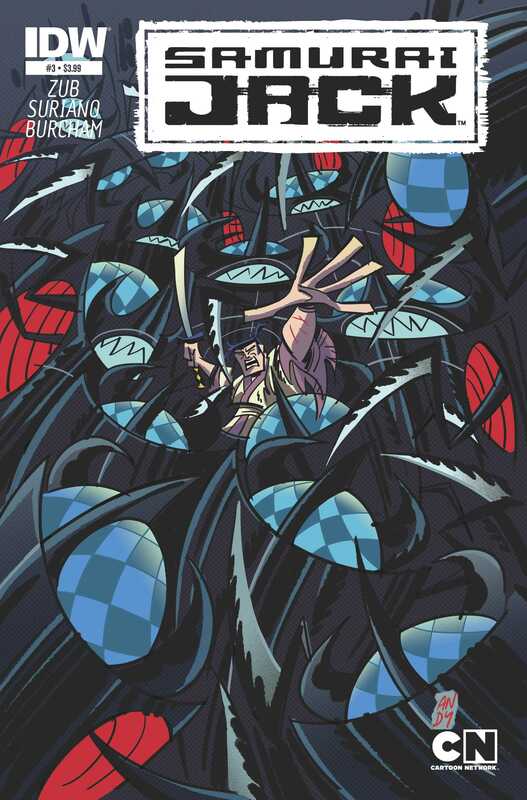 In the first two issues of Jim Zub and Andy Suriano’s Samurai Jack comics for IDW Publishing, a little bit of that emotional connection was missing. The stories were fantastic, and so was the art, but there was still that one missing component to them, in hindsight. With the third issue, released today, however that all changes. As with most Samurai Jack stories, this one involves Jack coming to a new place, meeting the local bigwigs, fighting some monsters, and getting out in the nick of time thanks to his amazing sword skills. But there’s still a bit of a twist here, and with that twist, Jim shows that he can keep things fresh for the readers as Jack searches for the Threads of Time to rewound the Rope of Eons and get back to his own time in order to defeat Aku. As with the previous two issues, I loved this one as well. One thing that has stood out for me across these three issues of the series so far is how creative Jim has been in “hiding” the Threads of Time. In the first issue they were in plain sight. In the second issue they were part of the villains’ clothing. And in the third issue, well, in the third issue Jim goes for another creative way to disguise them so that they are hidden until Jack is ready to take them. Or it, rather, since there is only a single Thread of Time here. In the previous issue and this one, the story has revolved around the Threads of Time, and that has added to the experience since the stories aren’t your regular beat ’em ups. Each story is Jack’s journey in exploring the hellish world that Aku has created and learning more about himself as well, in addition to helping other people. And for all of that, I gotta say that Jim definitely does get the character fully. He knows what makes him tick, what he’s liable to do and what not. Of course, a lot is dependent on Cartoon Network which must okay all the scripts and the art before they go into production and so there is a clear sense of adherence to established Samurai Jack lore, but still, that Jim writes such great stories is a testament to his understanding of the entire franchise in the first place. In this issue, he creates a new town and a new character, the Champion Gloer of the city of Grantus. The visuals are inspired by Greek/Roman culture if I’m not mistaken, and its fun to see that diversity in the comics here. With Gloer’s easy and encouraging dialogue, we see how Jack gets pulled into the situation, and how hard he has to fight to get out of it. The easy camaraderie between Gloer and Jack is definitely one of the high points of the comic and I really do wish that Gloer can come back again for future issues because I really do like his character. He’s no Scotsman, but he’s definitely a likeable enough character. And the ending, well, that’s just pure Samurai Jack ending right there, and is one where Jim really does nail Jack’s character. Loved the ending, which made me cry I should point given how much of an emotional punch it packs, and I’m excited about the next issue already, as always. Jim gives the artists, Andy Suriano and Josh Burcham, lots to do with in this issue. Whether we are talking about Grantus and its citizens, or we are talking about Gloer the Great, there’s a lot of material to work with here, and they recreate that Greco-Roman feel of Grantus quite well. Not to mention that Gloer’s body language, and his facial expressions are something to talk about as well because the two artists definitely do capture his feelings through the character’s poise. I really could not wish for any better artists to handle this series since the two of them have shown a penchant for drawing the (pretty much) perfect Samurai Jack comic. The bright colours in Grantus match well with the tragedy in the final third of the issue and the visual dissimilarities between the two emphasise the story as well. More Samurai Jack: #1, #2. Posted on December 18, 2013, in Comics Reviews, Review Central and tagged Andy Suriano, Animated Series, Cartoon Network, Cartoons, Comic, Comics Review, Demon Aku, Fantasy, Genndy Tartakovsky, IDW Publishing, Jim Zub, Josh Burcham, magic, Review, Review Central, Samurai, Samurai Jack, Sword and Sorcery, Techno-Fantasy, Techno-sorcery, Time Travel. Bookmark the permalink. 16 Comments.